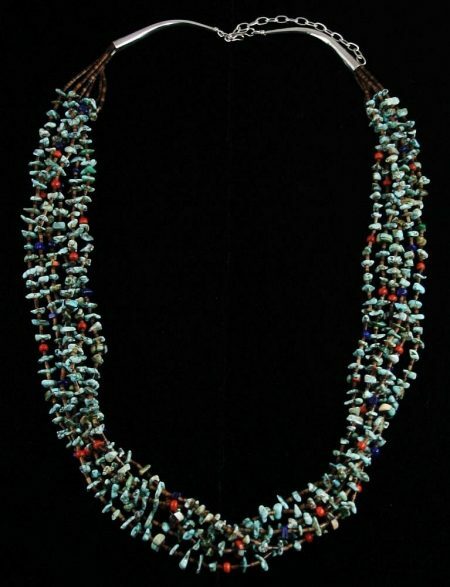 The Charlotte Reano family has created some of the most distinctive and unusual necklaces in Santo Domingo Pueblo using shells, turquoise, and intricate multi-color inlay. The pieces created by Charlotte are among the best. We are proud to have worked with her and her husband, Percy, for over thirty years, often supplying them with natural nugget turquoise with which she creates her jewelry. Award winning Santo Domingo Pueblo artist Charlotte Reano has created this museum quality 4-strand rare gem grade natural Nevada Dry Creek turquoise nugget necklace strung on handmade olive shell heishi. 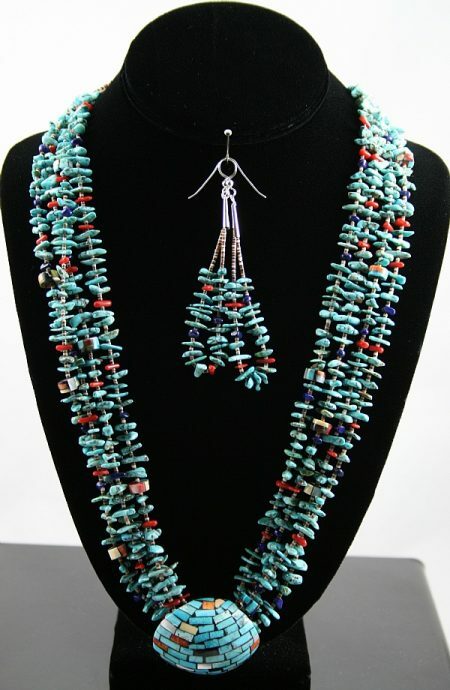 The nuggets are interspersed with coral, lapis and unique individually inlaid beads. In addition, this one of a kind piece is accented with an intricately inlaid natural spiny oyster shell pendant and includes a matching pair of earrings. The Dry Creek turquoise mine is now closed making this piece highly collectible.